Following the introduction of Christianity to England, a number of monasteries or minster churches would have been established in the county, but only three sites are easy to identify. One, at Breedon-on-the-Hill in the north-west of the county, in what would then have been Mercia, is documented in a charter of 675. The Anglo-Saxon Chronicles record that an early priest here, Tatwine, was consecrated as Archbishop of Canterbury in 731. The early importance of this monastery or minster, part of which is now a parish church, is apparent from the quality of the extant Saxon sculpture. The locations of two other minsters can be identified by their place names – Misterton in the south of the county (Minster-ton) and Buckminster in the north-east. The boundaries of the modern parishes that surround Misterton may hint at the extent of the area once served by the minster, but the territory of Buckminster is more difficult to deduce. It stands on the edge of a circle of parishes that cluster around Waltham-on-the Wolds, but the explanation for this pattern of boundaries may lie in the place name of their central point, a specific type of grazing land (wold) that was shared by the surrounding parishes. By the time of the Norman Conquest in 1066, a network of parish churches was developing, and Domesday Book (1086) mentions a priest in 42 places in the county. There were probably others, for none is recorded at Breedon, Buckminster or Misterton and neither is there any mention of a priest at Birstall, where the present church includes Saxon architecture and sculpture. 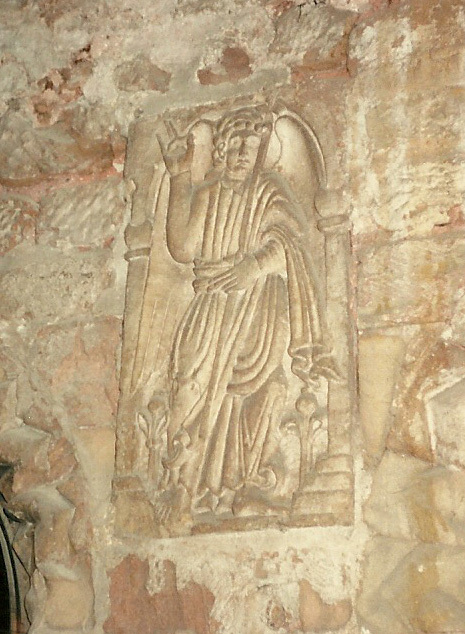 Many churches display Norman or Romanesque architecture, some of the finest being the sedilia (seats for priests celebrating mass) in the chancel at St Mary de Castro in Leicester and at Hallaton, where a tympanum (a semi-circular piece which would have stood over a door) depicts St Michael slaying a dragon. By the later medieval period Hallaton, perhaps the site of an Iron Age shrine, was again a place of pilgrimage. Dr Jane Laughton has found a reference to ‘St Mawrell of Hallaton’ in a will of 1532 and Dr Graham Jones has uncovered documentary and architectural evidence in this parish from the medieval period suggesting that the little-known St Morrell was revered here. Our parish churches also include reminders of everyday life in the Middle Ages. A bell was rung to tell people that a church service was about to take place, but the priest needed some means of knowing when that signal should be given. 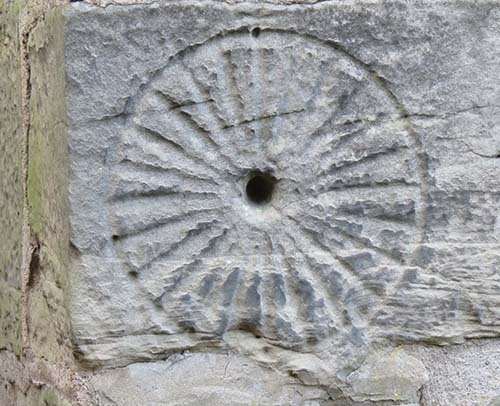 Scratch dials, also known as mass dials, can be seen on the south wall of many churches. A series of lines, representing the hours of the day or the times of the services, radiate out from a central hole, which would have contained a stick, known as a gnomon. At 6 am the shadow (if there was any sun) would be horizontal to the ground and to the left of the circle; at 12 noon the shadow would be cast vertically down from the central point, and would move across the right hand side of the circle through the afternoon, reaching the horizontal point at 6 pm in the daylight months. A fine example can be seen at St Peter’s church, Thornton (above). Unusually, this dial has 24 divisions, and it is possible that the two holes on the left hand circumference represent the time of the morning services. At around 30 and 45 degrees from the horizontal they would have marked the position of the sun at around 6.45 am and 7.45 am. Unfortunately, Leicestershire is not a county renowned for its medieval wall paintings, although there are doom paintings at Lutterworth, Great Bowden and Bottesford. Several medieval rood screens exist, but the people of Leicestershire do not appear to have left money to have pictures of saints painted on the panels in the fashion of the many surviving screens in counties such as Devon or Norfolk. There are a few good examples of early painted glass in the county, and a photographic archive is available to browse. Despite the rich grazing land available, the county does not possess any medieval churches to rival the finest of the ‘wool’ churches of the Gloucestershire Cotswolds or southern Suffolk. However, the church at Stoke Golding and the exquisite rich exterior of the south aisle at Gaddesby are worth driving many miles to see. An apparently 17th century panel at Stoke Golding claims that this church was founded by Robert de Campania and his wife Margaret in the reign of Edward I (1272-1307). The patron of the work at Gaddesby is a mystery, as is the contrast between the richness of the western part of the south aisle, which was probably constructed in around 1330, and the remainder of the church, which is far more restrained. It is possible that work at this church ceased as a result of the Black Death.